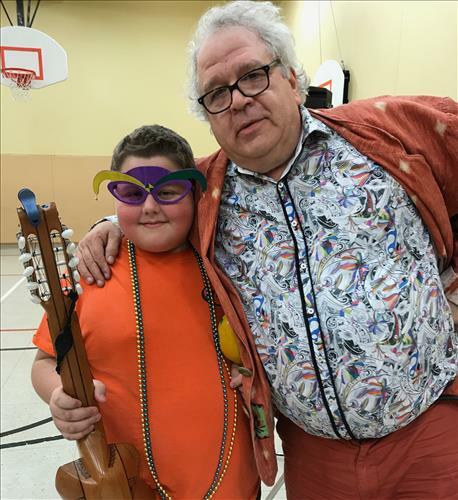 On a Tuesday in February, Cajun and Creole music could be heard throughout the halls of Langton Public School, as the delicious scent of fresh-baked beignets wafted through the air, and students donned masks they’d decorated with feathers, glitter and plenty of colour. It wasn’t just any Tuesday: the festivities were part of the school’s Mardi Gras celebration, and the music and food added a new element of understanding of Francophone culture and tradition. All day long, energetic, sharply dressed musicians entertained classes using a wide variety of instruments both familiar and new. Traditional fiddles, mandolins, accordions, and banjos were played along with the zydeco, charango, and hand drums. As students listened to and tried their hand at the instruments, the resulting teachable moments allowed them to get up close with this rich culture and its traditions. Students joined in using bucket drums, maracas, tambourines, spoons and the zydeco. The celebration also included food and crafts. Students enjoyed beignets, a popular sweet staple in Creole cuisine consisting of fried dough sprinkled with icing sugar, and a cup of chocolat chaud to go along with them. Many students also thoroughly enjoyed designing their own unique masks, bringing a personal touch to the New Orleans-style flare. The special day culminated with a parade through the school hallways to wrap up the celebration. Carnival king, Alex K. lead the parade while the Grade 5/6 and Grade 2/3 classes proudly played instruments and sang along to When the Saints Go Marching In, a spiritual hymn associated with Mardi Gras. The smiles on students faces as they paraded or watched from their classroom doors proved how worthwhile this day of learning and fun was.